The Studebaker President was the premier automobile model manufactured by the Studebaker Corporation of South Bend, Indiana (US) from 1926-1942. The nameplate was reintroduced in 1955 and used until the end of the 1958 model when the name was retired. 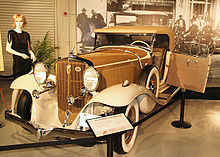 1932 President Convertible Coupe in the collection of the Studebaker National Museum. The primary advances of the 1931 engine was the increase in displacement to 337 cu in (5,520 cc) and the crankshaft was drilled for oil passage to each of its nine large main bearings. At this time, the straight-eight engines of many other firms had only five bearings; connecting the crank throws of every pair of cylinders between said bearings, their crankshafts had a heavy diagonal beam to take the stress, and the lubrication of the bearings was not as effective. Other advances for performance were that the valves had spring dampers and the muffler was a straight-through type. With these improvements the engine achieved 122 hp (91 kW). It also had modern filters for air, oil, and fuel, an improved thermostat, and a Lanchester vibration damper. In 1931, Studebaker introduced "Ovaloid" headlights which were oblong in shape and made identification of the President and other "senior" Studebaker models easier. Presidents manufactured in this era were considered to rival more expensive marques such as Cadillac, Packard, Lincoln, and Chrysler’s Imperial model range. Studebaker went into receivership during 1933-34, Albert Erskine committed suicide, and the era of the big, impressive President came to an abrupt end. For 1934, Studebaker trimmed its model lineup and streamlined its vehicles. The company designed a new body, the Land Cruiser, which was offered on the Dictator, Commander and President. The Land Cruiser models were easily identified by their extreme streamlining features, unusual 4-piece rear window, trunk and the full fender skirts on the rear of the vehicle. The new Presidents were smaller and less impressive than their predecessors, though still fine automobiles. For 1935, Presidents and Commanders offered an optional steel sliding roof similar to sunroofs common on vehicles today. In 1936, all Studebaker cars featured the "Planar" suspension system, and offered the "Startix" automatic engine-starting system as an optional accessory. 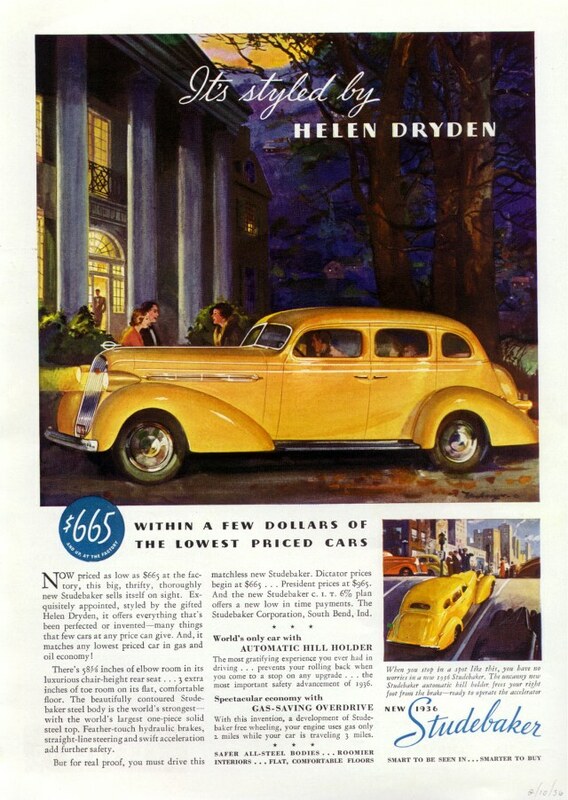 Vehicles manufactured from 1936 also showed the influence of industrial designer Raymond Loewy, who was hired as Studebaker’s design consultant, and Helen Dryden who specialised in interior styling. Studebaker made its Hill-Holder device (an anti-rollback brake system) standard on the President in that year. In 1938, the company offered a remote-controlled "Miracle-Shift" transmission which featured a dashboard-mounted shifter. The unit was discontinued in 1939 when the transmission shift lever was moved to the steering column. For 1941, the President received a new body style, a four-door sedan with rear-opening rear doors, as opposed to the then-conventional front-opening (suicide) rear doors. This vehicle was designated the Land Cruiser, recognizable by its concealed running-boards and lack of rear quarter-windows. The Land Cruiser was available in the beginning of 1941, in the Custom and DeLuxetone series. In mid year 1941, the Skyway series was introduced, with a Land Cruiser included. The Skyway had an upgrade in upholstery, and lacked the double strip of chrome down the side of the car. This style continued for the shortened 1942 model, after which the President was discontinued. The Skyway designation was, however, used for shortened 1946 Studebaker Champions. Studebaker reintroduced the President nameplate in 1955 when it was applied to all premium-trimmed vehicles. The most noteworthy of these later Presidents was the 1955 Studebaker Speedster. The President name was discontinued after the 1958 model year, when Studebaker began focusing on the compact Studebaker Lark. The final editions of Packard automobiles (1957-58) were based on this platform. The President set 118 stock car records in 1928. It also came in third in the 1932 Indianapolis 500. The Classic Car Club of America, regarded as the American authority for accreditation of "classic car" status, recognizes only the 38,403 8-cylinder FA & FB model Studebaker Presidents produced in 1928 and those produced between 1929 and 1933 as “full classics”. ^ In mid-July, 1928, four President eights covered 30,000 miles at Atlantic City in 19 days. Two roadsters averaged 68.37 mph and two sedans also averaged over 60 mph Later, two Presidents averaged 85 mph for 24 hours. "These new records, in addition to 102 long-distance marks established earlier in the year, gave Studebaker a total of 114 stock car records in 1928, thirty-one of which would still be unbroken some three and a half decades later. Betts, Charles. Studebaker as Gladiator: On the boards, the bricks and the salt. New Albany: Automobile Quarterly. pp. 258–265. Vol X, 3rd Q, 1972. ^ Katz, John F. (November 12, 2012). "The Governor's President". Autoweek: 35.